Carlson Gracie Senior was born August 13th, 1932. 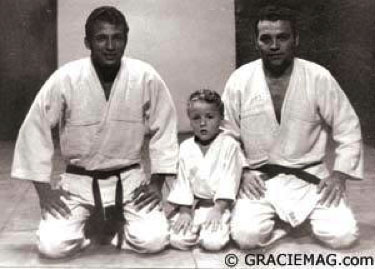 He was the first born son of Brazilian Jiu-Jitsu founder Carlos Gracie and his first wife, Carmen. Carlson was immersed and excelled at the art of Brazilian Jiu-Jitsu from his infancy. Learning from his father and his uncle Helio, Carlson participated in his first Martial Arts competition at the age of five! Carlson became an avid competitor as he grew older. He won the first official Brazilian Jiu-Jitsu tournament in Rio de Janeiro: The Campeonato Carioca de Jiu Jitsu. Traveling with his father and Uncles as a teenager and helping them demonstrate Jiu-Jitsu led to Carlson leaving school at the age of 15. However, Carlson was an avid reader and stressed the importance of learning in all facets of a person’s life. His students would joke how he’d test them randomly with questions he’d read from books he possessed. Carlson honed his fighting skills against people who challenged the Gracie Academy. He also tested his skills in other ways. When he wanted to refine a move, he’d go down to a beach in Rio that was renowned for being the hang-out for many tough guys, bodybuilders, etc. Carlson would bet them that they couldn’t beat him, and he’d work on his Jiu-Jitsu as they did their best to try and win his money. 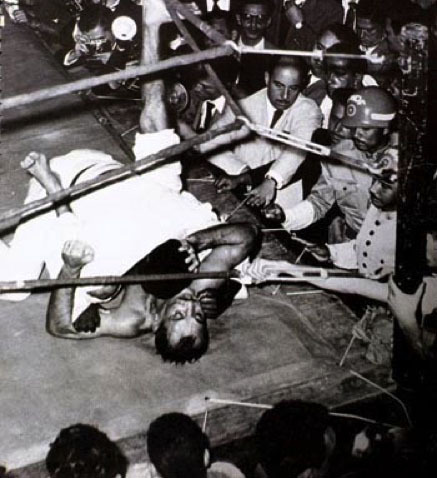 The first true test of his fighting prowess on a large stage came in 1955. Santana vs. Helio. Helio was much older and smaller but did his best. Carlson entered the ring as Santana celebrated and challenged him. Though they had been friends while training at the Gracie Academy, Carlson told him that he was going to receive a beating for what occurred with Helio. Helio wanted a re-match with Santana but Carlson was chosen by Carlos to avenge the Gracie Academy’s reputation. The fight generated a massive amount of interest in Brazil. It was on the front page of newspaper sports pages and covered by television. To generate even more interest, Carlos Gracie challenged Santana to a Gi Jiu-Jitsu match against Carlson. The match ended a draw but interest in the fight reached a fevered pitch. The fight was to take place in Rio at the Maracanazino, a famous sports venue. The bout quickly sold out all 25,000 seats in the arena. Carlson’s victory helped bring new attention and students to the Gracie’s style of Jiu-Jitsu. 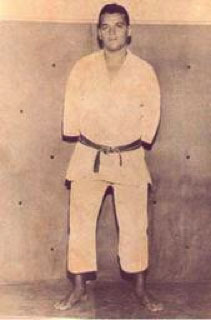 Carlson had been instructing at the Academy with Helio under the supervision of Carlos. Eventually, Carlson got married and wanted to start a family. He asked his father and Helio for a better salary from his teaching and Vale Tudo/MMA fights. Carlos told him his best opportunity for more money would be to start his own school, so that is what Carlson did. He moved to Copacabana and started what would become one of the most famous schools in BJJ/MMA: Clube Carlson Gracie de Jiu-Jitsu on Rua Figueiredo magalhares. Carlson beats Valdemar and avenges his uncle. 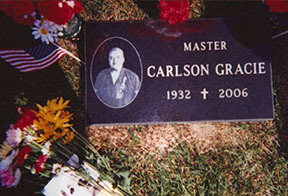 For many years, Carlson represented the Gracie family as its champion/representative. 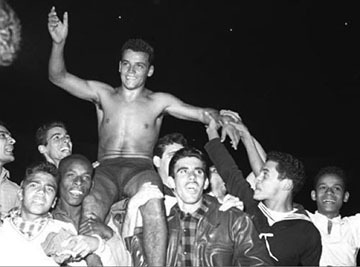 Carlson fought Santana again, a champion weightlifter, Luta Livre legends like Ivan Gomes and Euclides Pereria and once fought a Portugese olympic wrestler nicknamed “The Lion of Portugal” in front of 40,000 people. Carlson defeated the Lion with a Mata Leao choke after 4 minutes of fighting. Carlson also faced a former Gracie Academy pupil and student of Waldemar Santana on the television program “Night Gala”. The man was named Guano Vidal and had made many accusations against the Gracies. The fight ended with Carlson winning by TKO. Carlson officially fought 19 Vale Tudo fights and many more unofficial bouts. His only loss came to Luta Livre legend Euclides Pereira in a controversial bout. The match was fought in Euclides’ home-town with local judges and referees. At the beginning of the fight, the judges declared a rules shift that made Helio and Carlson leave the ring. The fight was originally to end only through KO or submission but was changed to 6 rounds and could end by judge’s scorecard. The Gracies only returned because the crowd became angry. While Euclides was a better stand-up fighter, Carlson was the better ground fighter. Carlson latched on a Mata Leao (rear naked choke) during the fight but saw Pereria supporters grab their man’s legs and pull him from the ring. Towards the end of the fight, Euclides was again pulled from the ring during a moment of trouble and did not return for 10 minutes. Audience members interfering in fights happened often at Vale Tudo fights where a ring was used since the audience would push in closely to the action. When Euclides was allowed to re-enter the ring, the referee and judges called the fight and gave him the judge’s decision. Euclides was an incredibly tough fighter(the only fighter to ever bloody Carlson’s nose). That bout always left a sour taste in Carlson Senior’s mouth. A student, wee Carlson Junior and Carlson Senior. Carlson began focusing more on instruction and leading his Jiu-Jitsu competition team. Carlson often disagreed with his father and Uncle’s method of teaching Jiu-Jitsu. He felt that nothing should be held back from the student and they should be encouraged to train their body’s strengths as well as their Jiu-Jitsu. 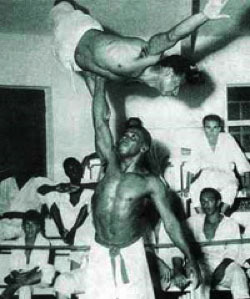 Carlson’s students were encouraged to lift weights, they could cross-train in other arts(like boxing and Judo) and were encouraged to compete in tournaments. Whenever a student had a question about a particular movement,counter, throw,etc.. they could count on Carlson Senior giving them the full range of his knowledge and experience. Carlson Senior also charged the smallest fee of any Brazilian Jiu-Jitsu school in Rio and that attracted many students who could not afford BJJ before. After a few bad results in Jiu-Jitsu tournaments, Carlson’s brother Rolls started visiting him to compliment his training at the Gracie Academy. Rolls would eventually move to Copacabana and teach at Carlson’s school. They ended up dividing the days each would teach. Rolls was extremely physically gifted and won titles in wrestling, sambo and judo as well as Jiu-Jitsu. Rolls would tragically die in a hang gliding accident. His students would end up forming great Jiu-Jitsu teams like Alliance and Gracie Barra. Carlson’s school would end up dominating the Jiu-Jitsu tournament scene for years. Senior produced champions in sports Jiu-Jitsu and in Vale Tudo/MMA. When a series of street fights prompted an organizer to put out a “DeSafio: Luta Livre versus Jiu-Jitsu” night of fights, Carlson was chosen by Carlos and Helio to train the Jiu-Jitsu fighters. Murillo Bustamante, Wallid Ismail and Fabio Gurgel of Alliance trained to represent Jiu-Jitsu and won every fight. Carlson’s school produced masters of guard passing like Amaury Bitetti and Wallid Ismail, guard masters like Sergio Boloao and Ricardo De La Riva, and sport BJJ champions like Rey Diogo, Carlson Junior, Amaury Bitetti and Ricardo Liborio. Carlson’s MMA pupils were the tent-pole of the young MMA scene in the 1990s. Carlson’s fighters like Vitor Belfort, Bustamante, Conan Silvera, Amaury Bitetti, Renato Tavares, Paulo Filho,etc… fought in organizations like PRIDE, UFC, WEC and smaller organizations like the Iron Crown Challenge. If there was an event in MMA at the time, a fighter with a connection to Carlson was probably involved. The sport grew and the successes with it became too heavy. Carlson’s team fractured under the strain. Reasons and excuses were thrown around but the famous Carlson Gracie Team took a huge blow as fighters left to join other teams or form their own. Carlson Senior forgave some of the students who left but was always hurt by the collapse of the team. 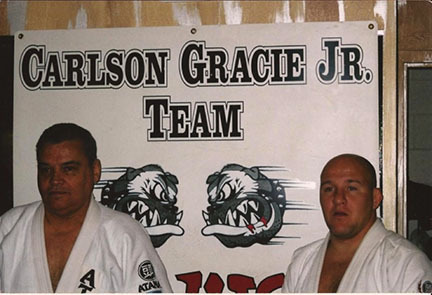 Carlson Gracie, Sr. and Carlson Gracie, Jr.
Carlson Gracie Junior invited his father to come and help teach at his academy in Chicago, Illinois. Carlson Senior looked past the cold and moved north. He taught at the Chicago Academy while also traveling around the US to give seminars. He’d instruct his students, both new and old, at tournaments to promote the art in the United States. His goal was to create a new factory of Champions with his son and return the team to dominance. Carlson Senior and Junior would also teach the “dirty Jiu-Jitsu” for the street they knew to Police Officers and Military personnel. Senior would again lead MMA fighters like Stephen Bonnar to the UFC and Miguel Torres to the WEC. He’d corner his students at smaller MMA promotions with the same fervor. 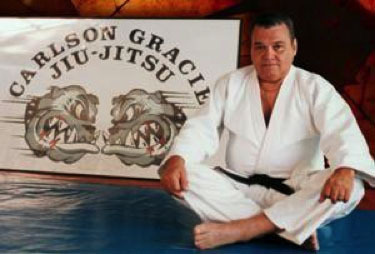 Carlson Gracie Senior died on the first day of February in 2006 from kidney problems. He left a giant mark on the MMA and Jiu-Jitsu worlds. His students would form some of the most successful teams in Jiu-Jitsu and MMA. 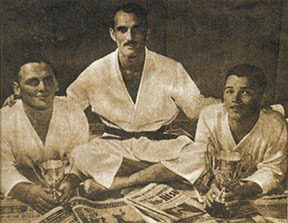 For years, he defended the family name and is considered with Carlos, Helio, Rolls and Rickson to be one of the 5 Family Champions of the Gracie Clan. Ask any informed fan of Martial Arts, Mixed Martial Arts or Jiu-Jitsu and they will know of the giant shadow cast by Carlson Gracie. Carlson Senior’s ashes were split between his home in Brazil and Chicago. This memorial is where they lie in Chicago at Cavalry Cemetery on Sheridan Road overlooking Lake Michigan. HERE is a link to all the current Carlson Gracie schools. ©2017. Designed by Betty Shonts.